@funyo, Dear Sir, would you be so kind to let me know, what I can read on the boards. Can I mooring with my houseboat on the Quay on the south west of bridge? 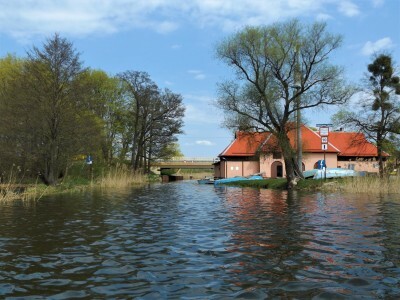 There is the sign "Koniec wód żeglownych" (the end of waterways?). This building is a base of fishermans and You can't mooring there. On the right, behind the picture is a little harbor with restaurant.